For the past 30 years, environmental, health, and safety (EHS) professionals have struggled to find the definitive set of performance metrics. The reality is that, while there is no universal set, there definitely is a group of key performance indicators for your company to use in order to win the competition game. And it takes a strategy, not a roll of the dice, to identify these metrics. What is going on here? First, EHS and corporate social responsibility professionals ride herd over a complicated arena that cannot be expressed in conventional business terms such as profit and loss. They find themselves caught between traditional, regulatory-required reporting and new demands coming from the investment community and non-governmental organizations (NGOs). Second, metrics change with time. What was off everyone's radar a decade ago is now a key management concern. (This is an important point discussed later in this article.) Third, EHS professionals take seriously this truism: What gets measured gets managed. And lastly, this passion for "measuring and communicating the business value of environmental activities" (a line taken from a GEMI publication) may be an indicator of professional insecurity. In other words, might it represent our quest to prove to business management that we serve a vital role in the company? Okay, insecurity may be a stretch, but let's assume for a moment that there is some underlying anxiety. When people worry, they will naturally seek reassurance: I'm okay, you're okay (or at least worse off than me). 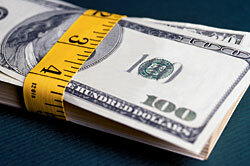 For EHS professionals, the operative questions become: "What are other companies measuring?" and "Where do we stand?" Benchmarking is important, of course, and executives love to see where they stand relative to the competition. But a benchmarking-based metrics strategy may not give much insight into long-term competitive positioning. I recognize that this statement may seem counterintuitive, but read on. So what metrics are strategic and how do you identify and measure them? To answer these questions, we must explore the basics of metrics and how EHS professionals can add strategic value. We'll start with a phenomenally simplified overview of business metrics. There are two types of internal business-measurement systems: management accounting and financial accounting. Financial accounting was developed to satisfy the needs of the investment community. What, how, and when these numbers are tracked and reported are controlled by the Financial Accounting Standards Board's (FASB) and the U.S. Securities and Exchange Commission's (SEC) rules and guidelines. They are almost always lagging indicators -- the final results. Management accounting tracks the numbers needed to run the business. These numbers generally are not reported externally. Indeed, most are confidential. The plant manager may be aware of the financial numbers reported to investors, but the numbers that really attract attention are things such as the "Widget Rejection Rate." These numbers are often leading indicators of longer-term financial performance (and the plant manager's bonus). Business managers now recognize that a myopic focus on the bottom line and lagging indicators is no way to successfully run a business. Business tools such as the Balanced Scorecard have driven this point home for decades by underscoring the importance of a blend of key metrics.2 While EHS professionals have embraced the need for both lagging and leading indicators, much of their thinking is still dominated by what other companies track and report, or by what government agencies or NGOs request. It is as if the metric set that matters is the one prescribed by some external accounting body akin to the SEC. With the advent of the Global Reporting Initiative (GRI), this depiction may not be too far from reality. Yes, a few of these numbers may matter, especially in the short term if the company is at the bottom of the EHS performance heap. In fact, they may strategically matter if, for example, an abysmal compliance or accident record becomes a public relations issue. But for most companies and under most circumstances, these metrics are not the numbers that will drive long-term competitive success any more than a few bottom-line financial metrics will drive business success over the long term. In addition, these numbers, which may be of interest to internal EHS professionals or some external stakeholders, may not be of much real interest to business management. A more subtle point is that the gold standards of EHS metrics -- accidents, violations, fines -- offer a rather dismal and narrow view of what EHS can bring to the table. EHS becomes only a cost of doing business, and the payout is problem avoidance -- about as exciting and strategic as checking to see that your fire insurance has not lapsed. EHS professionals create the most strategic business value when they are early predictors of key emerging issues and opportunities. For that matter, anyone inside a business can add strategic value if they can improve or create new products and services or production, sales, or marketing approaches. In addition, those who can help shape the company's strategic vision or help business executives achieve their vision add real value. EHS professionals' role in supporting strategic business objectives is becoming more and more important. The recent cover story on Wal-Mart's green strategy in Fortune magazine is one example; GE's focused energy strategy (Ecomagination) is another example; Intel's permitting strategy is another; and BP's "Beyond Petroleum" strategy is yet another. The list goes on and on. The first mistake, however, is to assume that only major corporations have anything to gain by strategically examining EHS and corporate social responsibility. A hypothetical example may help illustrate these dynamics. It is 1990 and Bigfoot, a small, athletic shoe company, decides to outsource most of its manufacturing to sites within developing countries. The EHS manager, who oversees social responsibility issues, does some research and is very concerned about the use of child labor in the countries where manufacturing is being outsourced. She explains to executive management that, while it is common practice in these countries, this issue eventually could become a consumer "hot button." Based on her research and recommendations, management accounting metrics are set, along with a strategy to gain control over the issue. Eventually, it becomes an integral part of the marketing strategy -- "The sneaker with a heart as well as a sole." Starting around 1996, the issue child-labor issue erupts. Nike products are boycotted. Bigfoot is now ideally positioned to make major competitive inroads because it saw the strategic dynamics in play early in the game. Today, all manufacturers are sensitive to "sweatshop" issues and many track and report their performance. The management accounting/leading indicator that Bigfoot set in 1990 has now shifted to the equivalent of a financial accounting/lagging indicator of performance. It is no longer strategic, but expected performance. Attention to child labor in the supply chain is widespread today. Not as prevalent, however, is concern over environmental issues arising from outsourcing to developing countries. I suspect that the former was propelled to prominence by influential U.S. labor unions and human rights organizations while the latter issue has few powerful champions. Furthermore, some company lawyers may literally prevent exploration of this environmental factor by their EHS professionals for fear of being drawn into liability concerns -- plausible deniability. But the fact remains that these supply chain issues can bubble to the surface, as illustrated by a recent front-page article in the Wall Street Journal over a polluting chemical plant in China.3 Again, environmental supply chain issues are just one potential emerging dimension; there are hundreds of other issues and opportunities for companies of any size to gain an edge. A metrics strategy centers on determining what really matters to internal and external stakeholders. This approach is exactly the strategy outlined by the Ford Motor Company in their "Materiality Matrix," which sets key performance indicators.4 The two dimensions in the three-by-three matrix are: (1) level of concern to stakeholders and (2) current or potential impact to company (i.e., what matters to management). Sounds obvious, but how do you get at these metrics? First, the effort required to gain this knowledge is significant -- it has little to do with benchmarking or the GRI; it has everything to do with understanding the business strategy and executive management's long-term objectives. The place to start is with the fundamentals: the EHS policy, vision, and mission. Yeah, right, you say. The problem is that these guiding principles often are created with political correctness in mind. Again, benchmarking also has a heavy influence on the process, rather than frank and meaningful discussions with the executive management and the board of directors. The usual creation process is for the EHS department -- in near isolation -- to come up with a draft for approval and then sell this to a detached business-management group using the fact that it is consistent with "current practices." EHS policy, vision, mission, and strategy should be derived from an intense series of information exchanges with management so that both parties (EHS and business management) can make informed decisions. This includes discussion on R&D activities, emerging issues, and business plans and objectives. It takes weeks of energy, potentially dozens of meetings, and possibly outside input and facilitation. If this process is done properly, the metrics can be mapped easily between what is truly important to the business and the leading or lagging EHS metrics that track these issues. The same mapping strategy applies to external stakeholders. First, research should be done to determine what really matters to stakeholders based on internal concerns and the potential impact of emerging issues on the company. Individual NGOs or research organizations may dictate either the politics or the science -- or both -- for these issues. Ideally, key stakeholders are interviewed, either directly in the case of community concerns or possibly through a neutral third party in the case of activist organizations. It is then possible to map the issues and look for overlaps and patterns. When I have done this for clients, the key issues and the metrics that track these become so obvious, they literally jump out from the page. No time and resources for this level of consideration, you say? It takes an effort on the same level as that required by the all-too-common EHS crisis. Goodness knows the resources are always available for that activity. Aside from becoming proactive rather than reactive, the greatest benefit from this strategy is that the metrics now have meaning and strategic significance to business management. In other words, they become THEIR key performance indicators, not YOUR metrics. It is not some random display on the roulette table. Each is tracked for a reason and each has significance. Business management now knows how to play the environmental game and what's at stake. 1 Personal communication with James Kearney, co-chairman of the GEMI Metrics Work Group, 8/10/06. See also Environmental Reporting in a Total Quality Management Framework: A Primer. 1994. For a catalog of publications, download www.gemi.org/GEMItoolscatalog-fall2005.pdf. Last visited 8/4/06. 2 R. Kaplan and D. Norton, "The Balanced Scorecard: Measures That Drive Performance," Harvard Business Review, (January-February) 1992: 71-79. 3 S. Oster and M. Fong, "In Booming China, a Doctor Battles a Polluting Factory -- Fouled Waters Lead to Flood of Protests Nationwide; Officials' Mixed Messages," Wall Street Journal, 7/19/06, Pages A1, A10. 4 http://www.ford.com/en/company/about/sustainability/report/impactsMaterialityMatrix.htm, last visited 8/11/06.